I query a database and pass the data for processing as a DataTable. After all computations (grouping, filtering, formatting etc.) I need to send it to a Web-Service as json that will generate emails. This means I need to convert it to a more json and html friendly structure because I need a header, body and footer parts separated. 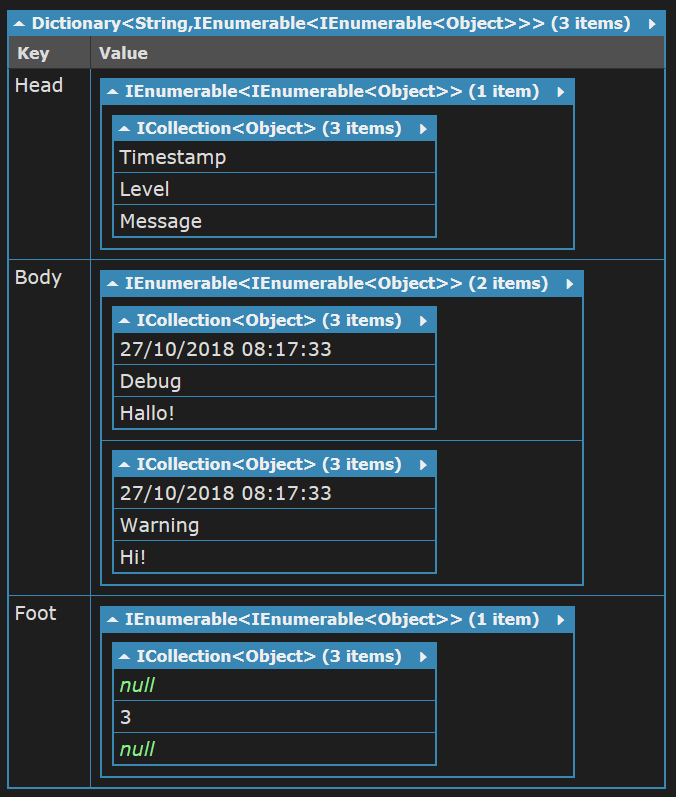 I was using a DataTable and a flat structure before but it's a pain to debug it as you never really know where the header, body or footer begin or end. Passing indexes around is very error prone. To make this conversion process more reliable and debug-friendly I created a couple of helpers. At the top there is the TripleTableDto that should resemble a html-table with its three parts. This is made of three TableDto<T>s that hold the actual data. ...and the RowDto that keeps an eye on the correct column order. It can work either with names or indexes and retrieves the actual column used as a key for the SortedDictionary in one of two other mapping dictionaries. I'm using here one of my dictionary extensions GetItemSafely that provides a wrapper exception with the name of the missing key for easier debugging. // All rows need to have the same length so initialize them with 'default' values. The order of the columns is supported by the ComparerFactory<T> that is a helper for creating IComparer<T>s without worrying about the null-checks or returning the correct number in each case. // Makes the compiler very happy. When I'm done filling this with data I call .Dump() on the TripleTableDto and pass it to the json-serializer to do the rest (it uses one more helper for converting my SoftString to json). //table.Foot.LastRow["levels"] = 3; // Boom! I'm sequentially adding data to this dto so there are not many APIs. Just as many as required to support this simple workflow: add a row, set its values, next... dump. In what way would you improve any of these classes? My main goal is to provide as much debugging help as possible when a mistake happens. I'd like to know primarily what went wrong and where without much effort. Preprocessing the data is tricky enough so I don't want to add any more logic on the user-side. This table-dto should be able to take care of itself. What do you think? Wouldn't it be better if the columns where typesafe in a way: ColumnDto<T>? Or it's maybe too complicated and unnecessary in the context. Not the answer you're looking for? Browse other questions tagged c# sorting dictionary json.net dto or ask your own question.